Challenge your kids with cool photography assignments! A great activity that will engage their creative side, develop new skills and give them something fun to focus on this fall. Visit Lenzr.com and choose a photography assignment. Lenzr challenges people of all ages and skill levels to upload specific images for a safe and friendly web competition in exchange for real prizes. At Lenzr, the membership picks the winners—Its super fun and easy, just shoot, upload, share with friends and family, get the most people to vote for your photo and you will win an iPad. 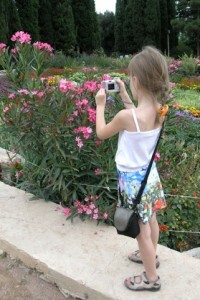 Parents looking to engage their children with fun and creative play activities can map out a Lenzr photo safari. It is a great way to learn, have fun and make memories by shooting photos of cool stuff where ever you live. You or your kids could win a nice new iPad for getting the most votes in the photo contest. This month’s photo safari starts with a trip to the rooftop deck – or any safe vantage point upon which a young person with a camera might capture a view of a distant rural horizon or urban cityscape. The View From The Roof photo contest on Lenzr hopes to collect and archive many different landscapes from all across Canada. Most will be from a vantage point about thirty feet or so above ground. Some folks who live in apartment buildings in big cities will have a much higher view from the roof. The Apple iPad prize was provided by a flat roof repair service that puts new white ToughRoof systems to work in the greater Toronto Area. Dan Sheridan is a white roof specialist and an expert at remodeling roofs into the perfect (all white = reflective) terrain for increased solar panel production. Which brings us to the second assignment in the weekend family photo safari. The Morning Sunshine photo contest is a little tricky only because it requires getting up really early and taking pictures in the special light that first burns off the morning mist. Its a magic hour thing. Special thanks to Michael Reichmann, the Ontario photographer who donated this Sunrise_Barn photo from his Ontario photography gallery . The contest sponsor is a portable solar power generator (PSG’s) design and manufacturing firm in southern Ontario. The Solarline Power, Mobile Solar Work Units are quiet, reliable and deliver clean renewable energy, more info about these solar trailers on the Lenzr blog. People Building Things photo contest is third and although it has the least pictures right now, its our belief this challenge is the easiest to enter and win. Although it seems like a very specific topic, anything constructive will probably be accepted in the match. This third iPad prize to be dispensed was purchased by a solar powered deck building company. The sponsors of this challenge use green building programs and clean energy to (quietly) cut lumber and make your backyard paradise. Submit pics of People Building Things and tell us the story behind each picture. In all three contests, the registered member that uploads the highest ranked image will WIN AN iPad! Voting begins September 20th 2010 – the highest ranked photograph for each contest automatically wins this awesome prize when the Contest Closes on Oct 1st, 2010. Contest is open to all Canadians (must be 13yrs old or older), not valid in Quebec. Good luck and happy shooting! Previous post: Cardiovascular Health and You: How to shop for your Heart!